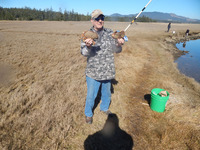 My friend Walter shows off two of the three Dungeness crabs caught at Sand Lake. We crabbed with 3 Crab Max crab traps for about an hour and a half prior to high slack. The crabber in the background caught 1 keeper Dungeness crab using a Crab Hawk. Click on the image to enlarge it.